When it comes to the unwritten rules of Valentine's gifts, bigger is always better. 12 long-stem roses, hand-arranged in a gorgeous ruby red gathering vase. 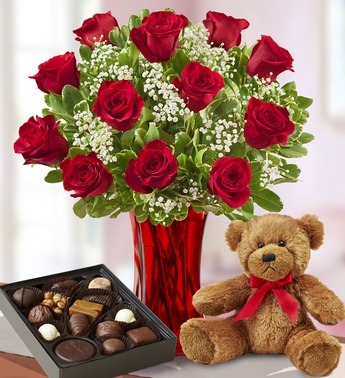 Then add a cuddly plush bear, Valentine Greeting Card and finish it off with an assortment of gourmet chocolates from Harry London.The only thing we've left out is a way for you to top yourself next year!